We are always trying to eat more vegetables, more greens! A quick stir-fry is one of the fastest, easiest, tastiest ways to make a last-minute vegetable side dish to suit any meal. Grace Young proved this to be true when she demonstrated a basic stir-fry recipe for us: Romaine lettuce leaves, warm and slightly wilted, tumbled in a sauce of garlic and chilies. After that — the same recipe and method, but this time with halved baby bok choy. We couldn't stop eating either of these. Here is a recipe and a stir-fry technique that any of us can take into our kitchens and adapt to just about any vegetable we find in the fridge. 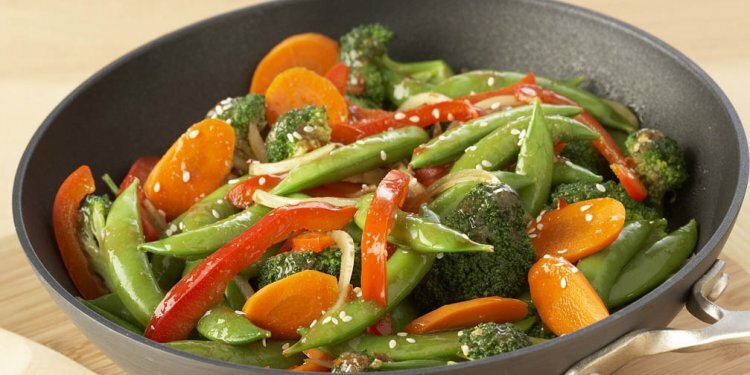 The technique for a vegetable stir-fry is the same no matter which vegetables you use. This stir-fry of romaine lettuce (and the second of baby bok choy) from Grace can just as easily be made with red peppers and mushrooms, asparagus and snow peas, or bok choy and green beans. Grace talking about how important it is to cut vegetables in the same size, and to make sure that they are very dry before stir-frying. • Dry the Vegetables: When stir-frying anything from snow peas to lettuce, it's important that the vegetables are very dry. Otherwise, the vegetables will steam and braise in the pan and lose their crisp texture. Giving the vegetables a whirl in a salad spinner is the easiest solution, but you can also pat them thoroughly with kitchen towels. • Pay Close Attention! All stir-frying is quick, but a stir-fry of just vegetables goes even quicker. Don't walk away from the stove or pause to answer a text! Once the oil is in the pan, a stir-fry needs your full attention. For a two to three minute recipe, we think we can handle that. 1. Cut Up the Ingredients: It is very important that all the ingredients are cut as directed in the ingredient list. The most important key to making a good stir-fry is cutting each ingredient to a uniform size as specified above. Cut the vegetables and set them aside in a bowl. Cut the aromatics as directed and set them aside as well. 2. Make the Sauce: In a small bowl, combine the sherry (or rice wine), broth, and soy sauce. 3. Prepare Your Wok Space: Set the bowls of vegetables, aromatics, and sauce near your stove. Also, have a very small bowl of water next to the stove. 4. Heat the Wok: Turn on a stove burner, as high as it will go. Set a 14-inch wok over this high heat burner. To determine when the wok is hot enough, start flicking droplets of water from the small bowl into the pan after 30 seconds. As soon as a bead of water evaporates within 1 to 2 seconds of contact, the wok is heated and ready for stir-frying. Do not overheat the wok. 6. Add the Aromatics to the Wok: Put the wok back on the heat. Add the garlic and chiles (if using), and stir them for 10 seconds or until fragrant. 7. Add the Vegetables: Push the garlic up the sides of the wok and add the lettuce (or bok choy, or whatever else you're using). 8. Season the Vegetables: Sprinkle the salt and pepper over top. 9. Set a Timer for 2 Minutes: It's helpful for newbie stir-fry cooks to set a timer to give them a rough idea of how long this dish will cook and to learn a sense of rhythm. But your main benchmark should be how the food looks and tastes. From this point on the vegetables will cook for approximately 2 to 2 1/2 minutes. 10. Stir-Fry the Vegetables for 1 Minute: Stir-fry for 1 minute or until the lettuce or vegetables begin to wilt. 11. Add the Sauce: Pour the sauce mixture around and down the sides of the pan instead of directly into the center (to prevent cooling the pan and lowering the cooking temperature). Stir-fry and toss to coat the lettuce. 12. Cover and Cook for 15 Seconds: Cover and cook for 15 seconds. 13. Uncover and Stir-Fry: Uncover and stir-fry for another 30 to 60 seconds, or until the lettuce is crisp-tender and bright green. • Substituting Other Vegetables: Substitute up to 4 cups of chopped firm vegetables or 8 to 12 cups of another leafy green for the lettuce or baby bok choy in this recipe. The finished stir-fried romaine lettuce. The finished baby bok choy.